Tahr, veitnamcam, Ryan and 7 others like this. That looks different,was yr wine nice. Marrons, fire, and burnt fingers... Great stuff! @Beaker, I just came up with the recette as I went along really but I will write it up tomorrow. Go and gather from the herb garden, some thyme, a couple of bay leaves, some nice parsley and chop fine. Except for the mushrooms and the breast meat, add the capsicum and herbs to the meats and using your hands, mix it all well together… add two teaspoons of allspice, salt, pepper, some finely crushed juniper berries, a sherry glass of brandy and one of Madeira or port. Mix in well. In a pan cook a little of the mix and do a taste test…add more salt and spices if it needs more. Put back in the fridge covered with foil or clingwrap. 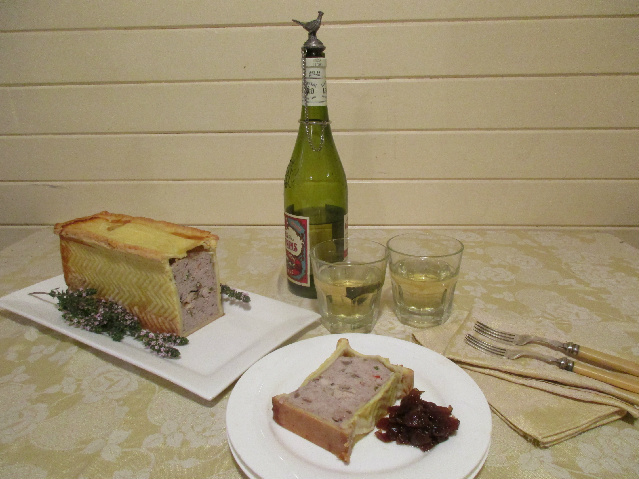 If you are cooking the pâté in a tin, you might like to add some stock jelly. This jelly will fill up the space under the lid…start by placing a pheasant carcass with a carrot, a stick of celery, a shallot, a bay leaf, a couple of juniper berries…cover with water, and cook gently to make a stock. When the water reaches about half of the volume, strain the stock through muslin and return the stock to the saucepan and reduce the liquid to about 300mls. Season with salt to taste and set aside. So, the following day, you can either use purchased shortcrust pastry or make a batch…grease a tin lightly with butter and line with the pastry…using a tablespoon spoon place the meat mix in the tin making sure that the mix is packed down with the back of the spoon…you want it firmly pressed in…fill the tin half way, then slice the browned breasts and lay them down the length of the tin, putting the sliced mushrooms in the crevices, then add the rest of the meat mix on top. Flatten the top of the meat. Add the lid of pastry, decorate if you want, and paint the lid with a mix of an egg yoke and a little milk. Cut two or three holes in the lid and with foil roll up each piece of foil to make vents and place them in each hole. Place the tin on an oven tray and cook for a hour and a half at 180c. When cooked allow the pâté to get cold, remove the foil. Heat the stock and add two teaspoons of gelatin and stir until it has melted; allow to get cool enough that it is becoming thick…using a small jug, carefully pour the jelly into the vent holes. Place the pâté in the fridge. You do not need to have a loaf tin or a terrine for this…you could just wrap the goodies in the pastry. Maca49 and deepsouthaussie like this.